What is Khao Sok Lake? How do I get to Khao Sok Lake? Khao Sok Lake is NOT in Khao Sok Village! It takes 1 hour to get to Khao Sok Lake from Khao Sok Village. Ban Ta Khun is the closest village to Khao Sok Lake. 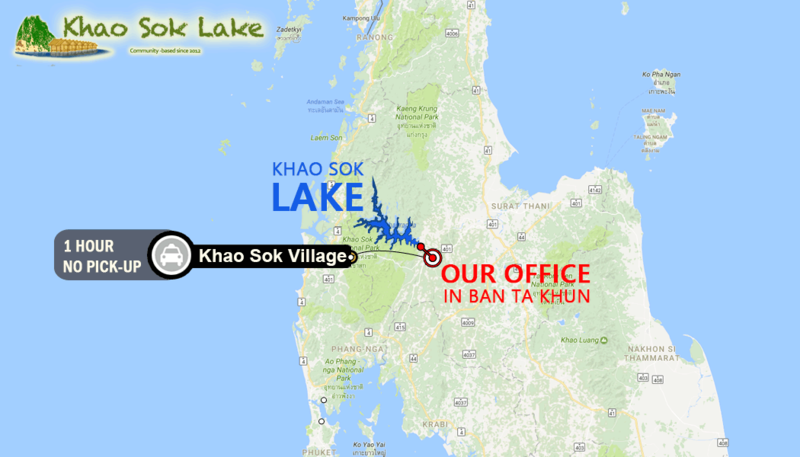 Our office is in Ban Ta Khun, just 15 minutes from the lake. For more on how to get here, please visit our transport page. How do I get to the Floating Bungalows? Floating bungalows are accessed by boat only! Khao Sok Lake is in the Khao Sok National Park. Foreign tourists are NOT ALLOWED on the lake without being accompanied by a national park guide. Can I book tours from the Floating Bungalows? No. The raft houses are remote and have no english-speaking staff or guides. A guide must travel with you on your trip. Our activities must be booked ahead of time. We make package tours because it’s often the only way you can get on the lake and do activities. Can I just hike from the Floating Bungalow on my own? No. There are no hiking trails accessible from the bungalows. You cannot get to any hikes without a boat from your floating bungalow and you cannot go onto a national park trail without a guide. What should I bring on Khao Sok Lake? You will need a few simple necessities to enjoy your time on the lake. You can repack all of these items into a small backpack or “Lake Bag”. 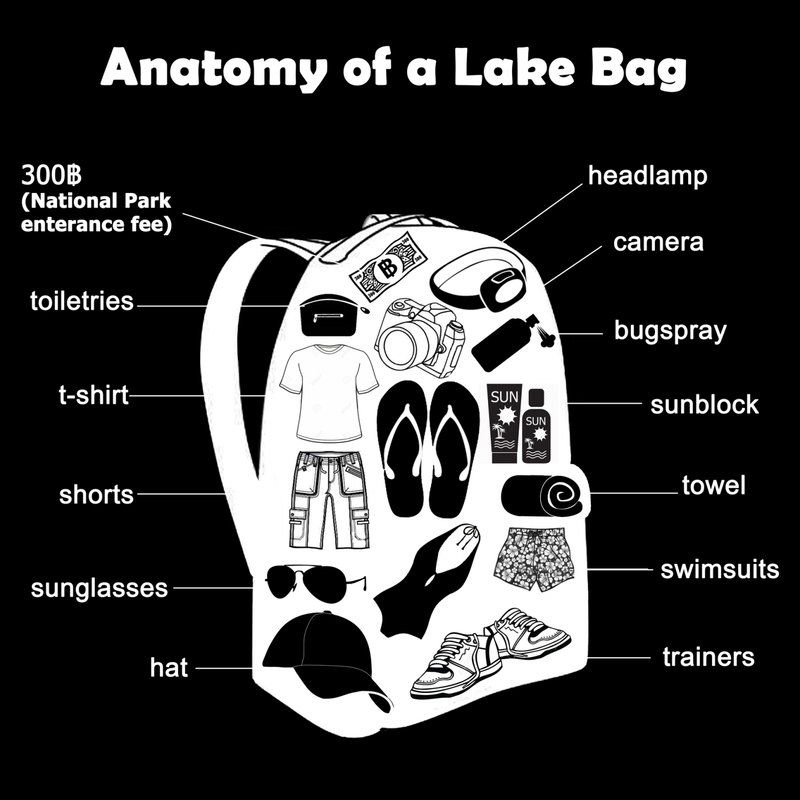 You can leave all of your excess baggage in our office locker while you are on the lake. What is not included in my Khao Sok Lake tour? You will need to pay the National Park Entrance Fee when you get to the gate of the national park. There, you will pay 300 baht per person to enter the park. If you would like to have beer, you can buy it at your floating bungalows or bring it with you. If you would like us to book a transfer to/from your tour, we can order you one. How Do I book a Khao Sok Lake Tour? Lake Tours go out onto the lake only, offering a chance to hike, kayak, go on wildlife safaris and more. They range in price based on how long you want to stay and what class of rafthouse you desire. Lake and Land Tours are named that way because they include accommodation and activities on land as well as a lake tour. These are the longest tours that we offer, some of them are as long as 4 days! These activities can include: elephant experience, Jungle Camping, Cultural tours. How do I choose between a Private Tour and a Group Tour?